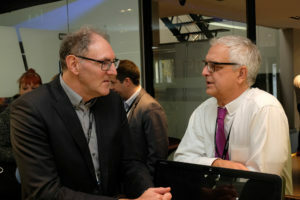 In the European demo center of Fujifilm in Zaventem BELGIUM, IARIGAI-member VIGC (Flemish Innovation center for graphic communication) gathered international experts in the field of inkjet printing. Developments in inkjet led to higher resolutions, better print quality and faster printing in multiple and broader formats. Purpose of the event was to discover the possibilities of inkjet printing on folding cartons and corrugated board. Steve Knight is the Co-founder of “The Inkjet Conference”, the largest inkjet event worldwide (http://theijc.com/). Steve was thus the perfect person to introduce us as a starting speaker in the world of inkjet. Typical inkjet properties can of course be best represented by enlarging them to recognizable proportions: in this way, you can consider classic print as “fillers”: you apply ink paste to a substrate by means of a pressure contact. For inkjet this is the emptying of a bucket of water. In order to achieve quality in this type of process, physical properties of inks and carrier must be well coordinated. A good starting point is to measure the surface energy of the wearer using, for example, a set of dyne markers. 40 dynes is considered here as a lower limit in order to be able to produce qualitative printed matter via inkjet. In addition to the technology, the business aspect comes naturally to inkjet: possibilities for personalization and low volumes can only be successful if supported by the right knowledge and data handling in the company. Each type of formulation has its own advantages and points of attention regarding food safety. UV-based inkjet can be a winner here, but a low migration variant is necessary to produce safe secondary packaging. This leads to specially developed ink formulations in which the chance of migration of ink components through the packaging material is minimized. Kevin provided insight into the migration results achieved with odorless and special low-migration inkjet inks. Finally, emphasis was placed on the need for communication at the various production stages in order to arrive at food-safe packaging. Communication & documentation is required in every production step, from raw materials, ink design, printing process to finished packaging. New technology and circular economy travel hand in hand. The recycling of packaging materials is becoming a necessity in the graphic production chain. Axel Fischer, head of public relations at INGEDE (international association of the deinking industry), offered us an independent insight into the recyclability of the various printing technologies. The recycling process itself is of course based on classic printing technology: oil-based ink that is separated from the paper pulp with water in a flotation process. Axel is clear about digital technology: dry toner is generally well recyclable. Inkjet shows a clear trend: Older inkjet technology, where water-based inks were applied to an untreated substrate, meant a nightmare in paper recycling. This was described in imagery by Axel as “the red sock in the washing machine”. The more recent inkjet machines have clearly addressed this fact. In combination with the applied primers (precoat), very high recycling rates can be scored now.